The Iranian Human Rights Council condemns the Saudi Public Prosector's demands to execute human rights activists. Iran, the top country on the list of capital punishments for 2017, has slammed Saudi Arabia for seeking to execute five human rights activists, including female activist Israa al-Ghumgham. 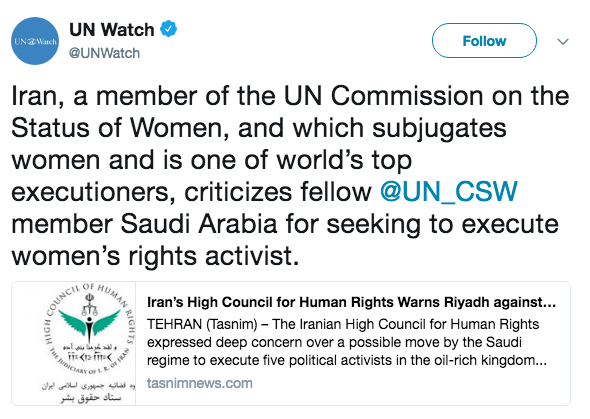 Despite the fact that Saudi Arabia’s crackdown on human and women rights activists is unacceptable and a clear human rights violation, the reaction from Iran’s Council of Human Rights came as shocking as the Saudi calls to execute the activists. 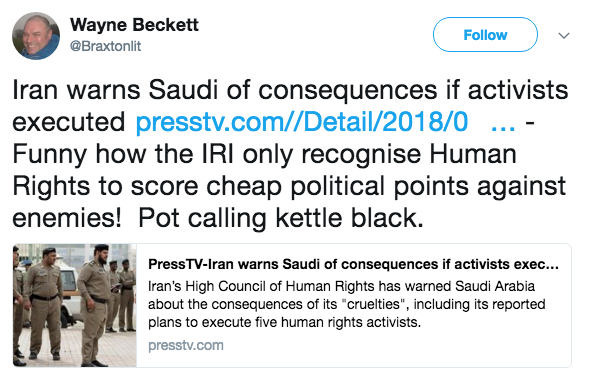 With this in mind, the latest report by Amnesty International listed Iran on the top of countries carrying out death penalty in the Middle East and North Africa for the past year (2017) followed by Saudi Arabia in the second ranking. During the reporting period, Iran carried out 507 executions while Saudi Arabia 146 people. The non-governmental human rights organization added that they could not confirm the credibility of the figures. The Iranian statement was faced by wide criticism, especially for their record in human rights violations and crackdowns on human freedoms and rights. 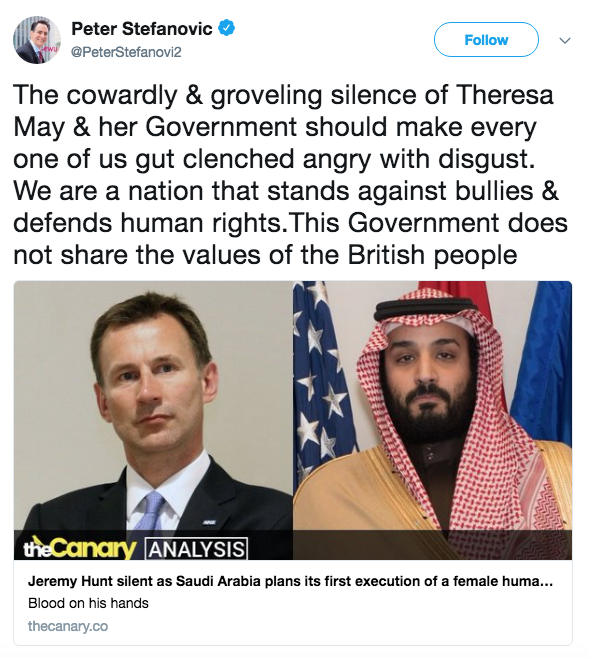 One user went to highlight the irony in how two of the most dictatorships in the region are arguing over human rights and executing activists. 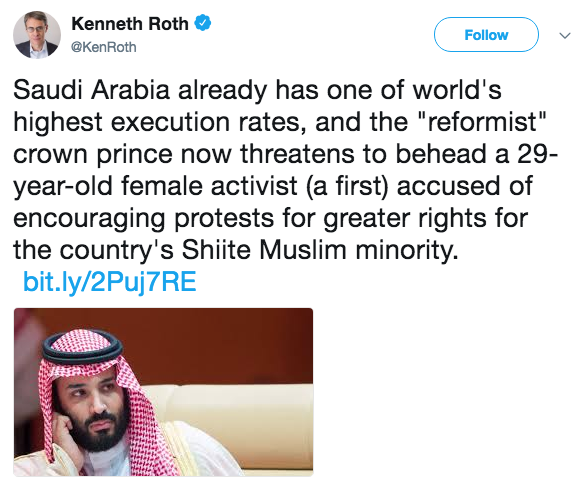 This comes following a report released by Human Rights Watch (HRW) last week that the Saudi Public Prosecution seeks death penalty against five activists, including Israa al-Ghumgham. The Public Prosecution that reports directly to the king, accused the activists of several charges including taking part in protests, attempts to inflame the public opinion in addition to “providing moral support to rioters” and many others. The HRW report sparked international outrage with people calling the international community to stand up and stop Saudi Arabia from executing the activists. 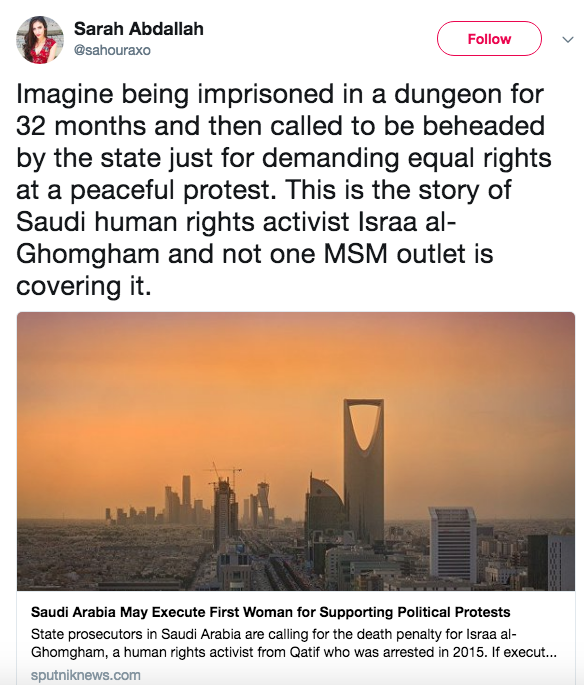 Israa al-Ghumgham, the activist that has her name publicly mentioned in the report, was known for her activism in mass demonstrations in the Eastern Province in early 2011, calling for an end to the systematic discrimination against Saudi Shia citizens in the Kingdom. She was arrested with her husband in 2015. During the last few months, Saudi Arabia have been witnessing crackdowns on several human rights activists in what is believed to be led by the young controversial crown prince, Mohammed bin Salman. 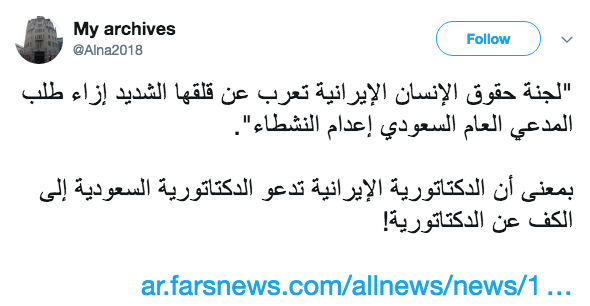 Meanwhile in Iran, several reports have emerged recently on the authorities attempts to silence activists who demand reforms in human rights situation and women rights in particular. HRW report revealed the harassment and threats received by the activists’ families from the Iranian authorities in attempts to stop their activism.